Educational CyberPlayGround: Will the MPAA Censor Art? WILL THE MPAA BE ABLE TO CENSOR ART? An anonymous poet has encoded the entire DeCSS descrambling algorithm in haiku form, mixed in with a bit of commentary about mathematics, physics, and poetry. And he included all the tables! It's quite a nice little piece to read. An audio recording of a person singing the source code, with guitar and drum accompaniment. An audio recording of a person reading the English version of the source code out loud. 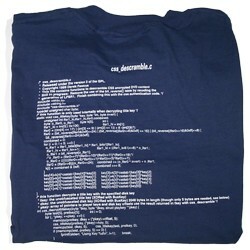 A photograph of a t-shirt on which the C source code is printed. Citing fear of lawsuits, a Princeton University professor canceled a talk describing how his research team cracked the security of digital music. 30 May 2002 Source: Hardcopy from the Electronic Frontier Foundation. Compare to recent testimony by Jack Valenti and MPAA members. [60 pages of testimony; duplicative prepared witness statements of 93 pages omitted. HOUSE OF REPRESENTATIVES, SUBCOMMITTEE ON COURTS, CIVIL LIBERTIES AND THE ADMINISTRATION OF JUSTICE OF THE COMMITTEE ON THE JUDICIARY, LAW BUILDING, MOOT COURTROOM, UCLA SCHOOL OF LAW, Los Angeles, Calif. The subcommittee met, pursuant to notice, at 2 p.m,, at the UCLA Law School, Los Angeles, Calif., Hon. Robert W. Kastenmeier (chairman of the subcommittee) presiding.